Common chimpanzees (a related species that diverged from bonobos about 2 million years ago) do engage in some altruistic behavior. For example, it's been shown that chimps will hand a tool that's out of reach to a person who clearly is trying to get it — as will human children. So Krupenye and some colleagues recently repeated that experiment with bonobos in a sanctuary. Parents of little kids are constantly reminding them to share. Those parents may be comforted to learn that humans are actually astonishingly willing to share and help, at least compared to other animals. Scientists want to understand the evolutionary roots of this altruism. NPR's Nell Greenfieldboyce says they've just learned something surprising. NELL GREENFIELDBOYCE, BYLINE: Our closest primate relative, chimpanzees, will sometimes do a good deed. If a person is using a stick as a tool but then that stick gets stolen and placed out of reach, a chimp that's able to will typically retrieve it and give it back. Kids do this too, by the way. Christopher Krupenye recently did this exact same experiment with bonobos, another primate that's closely related to us. UNIDENTIFIED PERSON: Keekwid (ph), Keekwid. GREENFIELDBOYCE: At a sanctuary, a bonobo in a cage watched a person reaching for a stolen stick and begging for help. And the bonobo just watched or would retrieve the stick but hold it just out of reach. CHRISTOPHER KRUPENYE: We saw some incidents that they were teasing, that they got the individual's desire. But they didn't help in this particular context. GREENFIELDBOYCE: Krupenye is an evolutionary anthropologist at the University of St. Andrews. He decided to do another experiment to explore sharing, this one with food - palm nuts that bonobos can crack open with rocks. Two bonobos were put in cages side by side with a window in between. KRUPRENYE: And so we gave one individual several nuts and the other individual several stones, and we wanted to see whether they would help each other out. Either of them could transfer their surplus resources to help their partner. UNIDENTIFIED PERSON: OK, Waka (ph) gave one nut to Masisi (ph). GREENFIELDBOYCE: The bonobos didn't usually hand over the rocks. KRUPRENYE: But we did find that they consistently transferred nuts to their partner. GREENFIELDBOYCE: That is unusual. 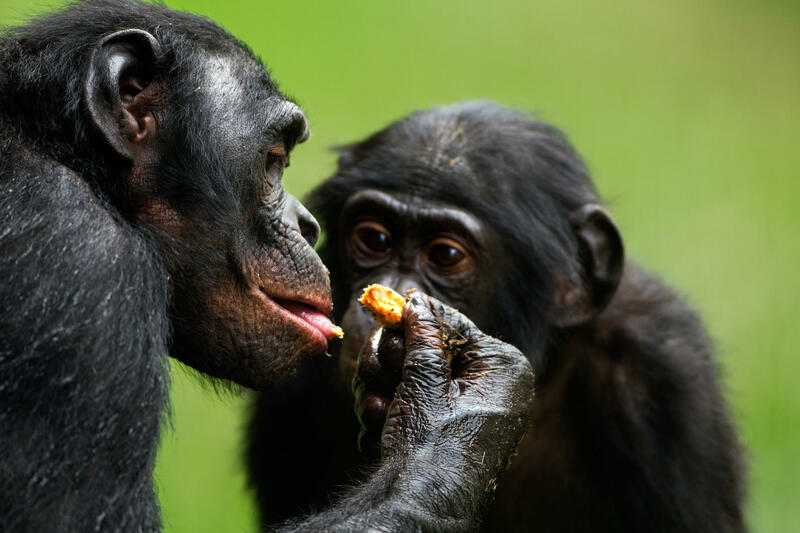 Chimps rarely share food. And when they do, it's usually more like tolerating theft sort of like when someone steals french fries from your plate. Other researchers agree that voluntarily handing over food that's in your possession is special. Zanna Clay is a primatologist at Durham University. ZANNA CLAY: What's been said in the past is chimps will help when they're asked to help, or, you know, they will give stuff when they're asked to. But it seems that bonobos are actually proactively doing it. JOAN SILK: Food sharing plays a really important role in all human society. GREENFIELDBOYCE: As for the tools, it's not clear why bonobos don't share them - maybe because they don't use tools in the wild. What is clear is that humans seem uniquely flexible and motivated when it comes to all kinds of helping and sharing. Silk says parents may not believe it, but compared to our closest primate relatives, little children are saints. Nell Greenfieldboyce, NPR News. Transcript provided by NPR, Copyright NPR.